At just 25, brilliant phenom Alexander Prior leads the SF Symphony through the dazzling opulence, color, and excitement of Romantic Age masterworks. 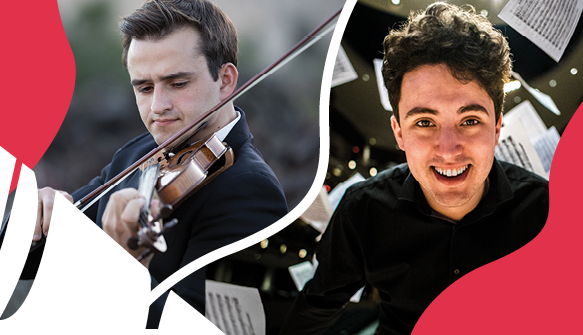 Witness the balletic lyricism and breathtaking virtuosity of Tchaikovsky’s legendary Violin Concerto, performed by renowned young violinist William Hagen. Then, be swept away by the lush beauty and turbulent drama of Rachmaninoff’s Symphony No. 2. Soloist William Hagen makes his entrance for this firecracker of a concerto after a gracious and suspense-building orchestral introduction. The first movement calls for remarkably virtuosic playing while the second movement is melodically inspired. Tchaikovsky’s finale might sound to us like an urban, cultured genre picture of country life but it struck some early listeners as pretty uncivilized! Rachmaninoff used to be criticized for wearing his heart on his sleeve; but, really, who would be so callous as to complain that such music as this enriches our world? The third movement’s principal theme, sung out by the clarinet, is irresistible, spun out at great length and balancing, as Rachmaninoff could do so ably, between the aesthetics of the concert hall and the most elevated sort of popular music. The Second Symphony is trademark Rachmaninoff.